Not to be confused with the Central African Republic or British Central Africa. 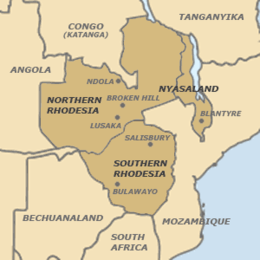 The Federation of Rhodesia and Nyasaland (also known as the Central African Federation, CAF) was a federal semi-Dominion that consisted of three southern African territories—the self-governing British colony of Southern Rhodesia and the British protectorates of Northern Rhodesia and Nyasaland—between 1953 and 1963. The Federation was established on 1 August 1953. The Federation was established with a Governor-General as the Queen's representative at the centre. An interesting and novel feature was the African Affairs Board, set up to safeguard the interests of Africans and endowed with statutory powers for that purpose, particularly in regard to discriminatory legislation. The constitutional status of the three territories – a self-governing Colony and two Protectorates – was not affected, though certain enactments applied to the Federation as a whole as if it were part of Her Majesty's dominions and a Colony. The economic advantages to the Federation were never seriously called into question, and the causes of the Federation's failure were purely political: the strong and growing opposition of the African inhabitants. The rulers of the new black African states were united in wanting to end colonialism in Africa. With most of the world moving away from colonialism during the late 1950s and early 1960s, the United Kingdom was subjected to pressure to de-colonize from both the United Nations and the Organization of African Unity (OAU). These groups supported the aspirations of the black African nationalists and accepted their claims to speak on behalf of the people. The federation officially ended on 31 December 1963. In 1964, shortly after the dissolution, Northern Rhodesia and Nyasaland became independent under the names Zambia and Malawi, respectively. In 1965, Southern Rhodesia unilaterally declared independence from the United Kingdom as the state of Rhodesia. While many points of contention were worked out in the conferences that followed, several proved to be acute, and some, seemingly insurmountable. The negotiations and conferences were arduous. Southern Rhodesia and the Northern Territories had very different traditions for the 'Native Question' (black Africans) and the roles they were designed to play in civil society. An agreement would likely not have been reached without Sir Andrew Cohen, CO Assistant Undersecretary for African Affairs (and a later Governor of Uganda). He became one of the central architects and driving forces behind the creation of the Federation, often seemingly singlehandedly untangling deadlocks and outright walkouts on the part of the respective parties. Cohen, who was Jewish and traumatised by the Holocaust, was an anti-racialist and an advocate of African rights. But he compromised his ideals to avoid what he saw as an even greater risk than the continuation of the paternalistic white ascendancy system of Southern Rhodesia – its becoming an even less flexible, radical white supremacy, like the National Party government in South Africa. Lord Blake, the Oxford-based historian, wrote: "In that sense, Apartheid can be regarded as the father of Federation." The semi-independent federation (a 'quasi-dominion') was finally established, with five branches of government: one Federal, three Territorial, and one British. This often translated into confusion and jurisdictional rivalry among various levels of government. According to Blake, it proved to be "one of the most elaborately governed countries in the world." The Constitution provided for a federal government with enumerated powers, consisting of an executive government, a unicameral Federal Assembly (which included a standing committee known as the African Affairs Board), and a Supreme Court, among other authorities. Provision was made for the division of powers and duties between the federal and territorial governments. Article 97 of the Constitution empowered the Federal Assembly to amend the Constitution, which included a power to establish a second legislative chamber. The Governor-General would be the representative of the Queen in the Federation. Federal authority extended only to those powers assigned to the federal government and to matters incidental to them. The enumerated federal powers were divided into a "Federal Legislative List" for which the federal legislature could make laws, and a "Concurrent Legislative List" for which both the federal and territorial legislatures could make law. :593 Federal laws prevailed over territorial laws in all cases where the federal legislature was empowered to legislate, including the concurrent list. A map of the Federation and its surrounding territories. The Southern Rhodesian capital of Salisbury doubled as Federal capital. It was commonly understood that Southern Rhodesia would be the dominant territory in the federation – economically, electorally, and militarily. How much so defined much of the lengthy constitutional negotiations and modifications that followed. African political opposition and nationalist aspirations, for the time, were moot. Decisive factors in both the creation and dissolution of the Federation were the significant difference between the number of Africans and Europeans in the Federation, and the difference between the number of Europeans in Southern Rhodesia compared to the Northern Protectorates. Compounding this was the significant growth in Southern Rhodesia's European settler population (overwhelmingly British migrants), unlike in the Northern Protectorates. This was to greatly shape future developments in the Federation. In 1939, approximately 60,000 Europeans resided in Southern Rhodesia; shortly before the Federation was established there were 135,000; by the time the Federation was dissolved they had reached 223,000 (though newcomers could only vote after three years of residency). Nyasaland showed the least European and greatest African population growth. The dominant role played by the Southern Rhodesian European population within the CAF is reflected in that played by its first leader, Sir Godfrey Huggins (created Viscount Malvern in 1955), Prime Minister of the Federation for its first three years and, before that, Prime Minister of Southern Rhodesia for an uninterrupted 23 years. Huggins resigned the premiership of Southern Rhodesia to take office as the federal Prime Minister, and was joined by most United Rhodesia Party cabinet members. There was a marked exodus to the more prestigious realm of federal politics. The position of Prime Minister of Southern Rhodesia was once again, as under Britain's Ministerial Titles Act of 1933, reduced to a Premier and taken by The Rev. Garfield Todd, the soon-to-be controversial centre-left politician. It was considered that Todd's position and territorial politics in general had become relatively unimportant, a place for the less ambitious politician. In fact, it was to prove decisive both to the future demise of the CAF, and to the later rise of the Rhodesian Front. Rather than a federation, Huggins favored an amalgamation, creating a single state. However, after World War II, Britain opposed this because Southern Rhodesia would dominate the property and income franchise (which excluded the vast majority of Africans) owing to its much larger European population. A federation was intended to curtail this. Huggins was thus the first Prime Minister from 1953 to 1956, and was followed by Sir Roy Welensky, a prominent Northern Rhodesian politician, from 1956 to the Federation's dissolution in December 1963. The fate of the Federation was contested within the British Government by two principal Ministries of the Crown in deep ideological, personal and professional rivalry – the Colonial Office (CO) and the Commonwealth Relations Office (CRO) (and previously with it the Dominion Office, abolished in 1947). The CO ruled the northern territories of Nyasaland and Northern Rhodesia, while the CRO was formally but indirectly in charge of Southern Rhodesia. The Northern Territories opposed a Southern Rhodesian hegemony, one that the CRO promoted. Significantly, the CO tended to be more sympathetic to African rights than the CRO, which tended to promote the interests of the Southern Rhodesian (and to a lesser extent, Northern Rhodesian) European settler populations. It was convenient to have all three territories colonized by Cecil Rhodes under one constitution. But, for Huggins and the Rhodesian establishment, the central economic motive behind the CAF (or amalgamation) had always been the abundant copper deposits of Northern Rhodesia. Unlike the Rhodesias, Nyasaland had no sizeable deposits of minerals and its tiny community of Europeans, largely Scottish, was relatively sympathetic to African aspirations. Its inclusion in the Federation was always more a symbolic gesture than a practical necessity. Ironically, it was to be largely Nyasaland and its African population where the impetus for destabilization of the CAF arose, leading to its dissolution. Despite its convoluted government structure, the CAF economy was a success. In the first year of the federation, its GDP was an impressive £350 million; two years later it was nearly £450 million. Yet the average income of a European remained approximately ten times that of an African employed in the cash economy, representing only one third of local Africans. In 1955, the creation of the Kariba hydro-electric power station was announced. It was a remarkable feat of engineering creating the largest human-built dam on the planet at the time and costing £78 million. Its location highlighted the rivalry among Southern and Northern Rhodesia, with the former attaining its favoured location for the dam. The CAF brought a decade of liberalism with respect to African rights. There were African junior ministers in the Southern Rhodesia-dominated CAF, while a decade earlier only 70 Africans qualified to vote in the Southern Rhodesian elections. The property and income-qualified franchise of the CAF was, therefore, now much looser. While this troubled many whites, they continued to follow Huggins with the CAF's current structure, largely owing to the economic growth. But to Africans, this increasingly proved unsatisfactory and their leaders began to voice demands for majority rule. African dissent in the CAF grew, and at the same time British Government circles expressed objections to its structure and purpose – full Commonwealth membership leading to independence as a dominion. In June 1956, Northern Rhodesia's Governor, Sir Arthur Benson, wrote a highly confidential letter heavily criticising the federation in general (and the new constitution planned for it) and Federal Prime Minister, Sir Roy Welensky, in particular. Nearly two years later, Huggins (now Lord Malvern) somehow obtained a copy of it and disclosed its contents to Welensky. Relations between Whitehall and the CAF cabinet were never to recover. These events, for the first time, brought the attention of British Conservative Prime Minister, Harold Macmillan, to a crisis emerging in the CAF, but apparently he did not fully comprehend the gravity of the situation, attributing the row to the old CO-CRO rivalry and to Welensky taking personal offence to the letter's contents. The issues of this specific row were in the immediate sense resolved quietly with some constitutional amendments, but it is now known that Welensky was seriously considering contingencies for a Unilateral Declaration of Independence (UDI) for the federation, though he ended up opting against it. Meanwhile, towards the end of the decade, in the Northern Territories, Africans protested against the white minority rule of CAF. In July 1958 Hastings Banda, the leader of the Nyasaland African Congress (NAC) (later Malawi Congress Party), returned from Great Britain to Nyasaland, while in October the militant Kenneth Kaunda became the leader of the Zambian African National Congress (ZANC), a split from the Northern Rhodesian ANC. The increasingly rattled CAF authorities banned ZANC in March 1959, and in June imprisoned Kaunda for nine months. While Kaunda was in gaol, his loyal lieutenant Mainza Chona worked with other African nationalists to create the United National Independence Party (UNIP), a successor to ZANC. In early 1959, unrest broke out in Nyasaland, which, according to historian Robert Blake, was "economically the poorest, politically the most advanced and numerically the least Europeanized of the three Territories." The CAF government declared a state of emergency. Dr Banda and the rest of Nyasaland's NAC leadership were arrested and their party outlawed. Southern Rhodesian troops were deployed to bring order. The controversial British Labour MP John Stonehouse was expelled from Southern Rhodesia shortly before the state of emergency was proclaimed in Nyasaland, which outraged the British Labour Party. The affair drew the whole concept of the federation into question and even Prime Minister Macmillan began to express misgivings about its political viability, although economically he felt it was sound. A Royal Commission to advise Macmillan on the future of the CAF, to be led by The Viscount Monckton of Brenchley, QC, the former Paymaster General, was in the works. The Commonwealth Secretary, The Earl of Home, was sent to prepare Welensky, who was distinctly displeased about the arrival of the Commission. Welensky at least found Lord Home in support of the existence of the CAF. By contrast, Lord Home's rival, and fellow Scot, the Colonial Secretary, Iain Macleod, favoured African rights and dissolving the federation. Although Macmillan at the time supported Lord Home, the changes were already on the horizon. In Britain, Macmillan said that it was essential "to keep the Tory party on modern and progressive lines", noting electoral developments and especially the rise of the Labour Party. By the time Macmillan went on his famous 1960 African tour leading to his Wind of Change speech to Parliament in Cape Town change was well underway. By 1960, French African colonies had already become independent. Belgium more hastily vacated its colony and thousands of European refugees fled the Belgian Congo from the brutalities of the civil war and into Southern Rhodesia. During the Congolese crisis, Africans increasingly viewed CAF Prime Minister, Sir Roy Welensky, as an arch-reactionary and his support for Katanga separatism added to this. Ironically, a few years later, in his by-election campaign against Ian Smith’s Rhodesian Front, RF supporters heckled the comparatively moderate Welensky with cries of 'bloody Jew', 'Communist', 'traitor' and 'coward'. The new Commonwealth Secretary, Duncan Sandys, negotiated the '1961 Constitution', a new constitution for the CAF which greatly reduced Britain's powers over it. But by 1962, the British and the CAF cabinet had agreed that Nyasaland should be allowed to secede, though Southern Rhodesian Premier Sir Edgar Whitehead committed the British to keep this secret until after the 1962 election in the territory. A year later, the same status was given to Northern Rhodesia, decisively ending the Federation of Rhodesia and Nyasaland in the immediate future. In 1963, the Victoria Falls Conference was held, partly as a last effort to save the CAF, and partly as a forum to dissolve it. After nearly collapsing several times, it ended by 5 July 1963, and the state was virtually dissolved. Only the appropriation of its assets remained as a formality. By 31 December, the Federation of Rhodesia and Nyasaland was formally dissolved and its assets distributed among the territorial governments. Southern Rhodesia obtained the vast majority of these including the assets of the Federal army, to which it had overwhelmingly contributed. In 1964, Northern Rhodesia gained independence as the Republic of Zambia, obtaining majority rule and led by Kenneth Kaunda. The same year, the Nyasaland Protectorate became independent Malawi led by Hastings Banda. On 11 November 1965, Southern Rhodesia's government led by Prime Minister Ian Smith proclaimed a Unilateral Declaration of Independence from the United Kingdom. This attracted the world's attention and created outrage in Britain. The Minister of Defence was the President of the Defence Council, which consisted of military and civilian members, and considered all matters related to defense policy. The Regular Army Depot, based in Salisbury, handled all basic training for black recruits. The Depot, The Royal Rhodesia Regiment, trained recruits for the Territorial Force battalions. Corps training was handled by the Rhodesia and Nyasaland Corps of Engineers, Corps of Signals, and the Army Service Corps. In May 1958, three installations were named after "three of the most famous soldiers in the military history of Central Africa". The RAR camp in Llewellin was named Methuen Camp after Colonel JA Methuen. The Zomba Cantonment was named Cobbe Barracks after Lieutenant Colonel Alexander Cobbe. The Lusaka military area was named Stephenson Barracks after Lieutenant Colonel A Stephenson. Llewellin Barracks in Bulawayo commemorated the first Governor-General of the Federation. The Battle of Tug Argan was commemorated in the name of Tug Argan Barracks in Ndola. Although the Federation of Rhodesia and Nyasaland only lasted for 10 years, it had an important impact on Central Africa. Its white minority rule, where a couple of hundred thousand Europeans – primarily in Southern Rhodesia – ruled over millions of Africans, was largely driven by paternalistic reformism, which included racism, that collided with rising African self-confidence and nationalism. The British influenced and affiliated federation and its institutions and racial relations differed from the only other regional power, the Union of South Africa. The dissolution of the CAF highlighted the discrepancy between the independent African-led nations of Zambia and Malawi, and Southern Rhodesia (which remained ruled by a white minority government until the Internal Settlement in 1978). Southern Rhodesia soon found itself embroiled in a civil war between the government and African nationalist and socialist guerrillas, whereas both Malawi and Zambia developed into authoritarian one-party states and remained so up until the post-Cold War era. Following Southern Rhodesia's unilateral declaration of independence, a growing conflict emerged between two of the former CAF territories – Zambia (supporting African nationalists) and Southern Rhodesia (supported by South Africa) – with much heated diplomatic rhetoric, and, at times, outright military hostility. The Federation issued its first postage stamps in 1954, all with a portrait of Queen Elizabeth II. See main article at Postage stamps of the Federation of Rhodesia and Nyasaland. Revenue stamps were also issued, see Revenue stamps of the Federation of Rhodesia and Nyasaland. ^ Federation of Rhodesia and Nyasaland (Dissolution) Order in Council, 1963, S.I. 1963 No. 2085, p.4477. ^ a b c d e f g h i j k Brelsford, ed. (1960). Handbook to the Federation of Rhodesia and Nyasaland. London: Cassell and Company, Ltd.
^ Hodder-Williams, Richard (1983). White Farmers in Rhodesia, 1890–1965: A History of the Marandellas District. Basingstoke: Macmillan Press. pp. 219–220. ISBN 978-1349048977. ^ Shaw, Carolyn Martin (2015). Women and Power in Zimbabwe: Promises of Feminism. Champaign: University of Illinois Press. pp. 37–38. ISBN 978-0252081132. ^ Wills, A.J. (1967). "Three Territories". An Introduction to the History of Central Africa (2nd ed.). Durban: Oxford University Press. p. Appendix IV. ISBN 0-620-06410-2. Retrieved 10 September 2012. Franklin, Henry. Unholy wedlock: the failure of the Central African Federation (G. Allen & Unwin, London, 1963). Blake, Robert. A History of Rhodesia (Eyre Methuen, London 1977). Hancock, Ian. White Liberals, Moderates, and Radicals in Rhodesia, 1953–1980 (Croom Helm, Sydney, Australia, 1984). Mason, Phillip Year of Decision: Rhodesia and Nyasaland in 1960 (Oxford University Press, 1961). Phillips, C. E. Lucas. The vision splendid: the future of the Central African Federation (Heinemann, London, 1960). Leys, Colin and Pratt Cranford (eds.). A new deal in Central Africa (Heinemann, London, 1960). Clegg, Edward Marshall. Race and politics: partnership in the Federation of Rhodesia and Nyasaland. (Oxford University Press, 1960). Gray, Richard. The two nations: aspects of the development of race relations in the Rhodesias and Nyasaland (Greenwood Press, Westport, Conn., 1960). Rogaly, Joe. Rhodesia: Britain's deep south. (The Economist, London, 1962). Hall, Richard. The High Price of Principles: Kaunda and the White South (Hodder and Stoughton, London, 1969). Guy Clutton-Brock. Dawn in Nyasaland (Hodder and Stoughton, London 1959). Hanna, Alexander John. The story of the Rhodesias and Nyasaland. (Faber and Faber, 1965). Black, Colin. The lands and peoples of Rhodesia and Nyasaland (Macmillan, NY, 1961). Sanger, Clyde. Central African emergency (Heinemann, London 1960). Gann, Lewis H. Huggins of Rhodesia: the man and his country (Allen & Unwin, London, 1964). Gann, Lewis H. Central Africa: the former British states (Englewood Cliffs, N. J., Prentice-Hall, 1971). Haw, Richard C. (fwd. by Sir Godfrey Huggins) No other home: Co-existence in Africa (S. Manning, Bulawayo, Southern Rhodesia, 1960?). Taylor, Don. The Rhodesian: the life of Sir Roy Welensky. (Museum Press, London 1965). Wood, J.R.T. The Welensky papers: a history of the federation of Rhodesia and Nyasaland (Graham Pub., Durban, 1983). Welensky, Roy, Sir. Welensky's 4000 days: the life and death of the Federation of Rhodesia and Nyasaland (Collins, London, 1964). Allighan, Garry. The Welensky story (Macdonald, London, 1962). Alport, Cuthbert James McCall, Lord. The sudden assignment: being a record of service in central Africa during the last controversial years of the Federation of Rhodesia and Nyasaland, 1961–1963. (Hodder and Stoughton, London, 1965). Walker, Audrey A. The Rhodesias and Nyasaland: a guide to official publications (General Reference and Bibliography Division, Reference Dept., Library of Congress: for sale by the Superintendent of Documents, US Govt. Print. Off., 1965). Standard Bank of South Africa, Ltd. The federation of Rhodesia and Nyasaland: general information for business organisations. (London, 1958). Sowelem, R. A. Toward financial independence in a developing economy: an analysis of the monetary experience of the Federation of Rhodesia and Nyasaland, 1952–63. (Allen & Unwin, London, 1967). Shutt, Allison K (2015). Manners Make A Nation: Racial Etiquette in Southern Rhodesia, 1910–1963. Rochester: University of Rochester Press.